When you visit museums, how long do you look at a work of art? One minute? Half a minute? 10 second? People generally spend as much time as it takes to stop in front of a painting before moving on to the next. Galleries packed with gorgeous, interesting, and priceless works of art seem to inadvertently encourage this walking-viewing strategy. While I’ve discussed having “museum goals” to focus your time, visitors still try to look at everything in the gallery which ironically may mean leaving without seeing much at all. As a challenge to this rapid viewing experience, Slow Art Day asks museum visitors to spend 10 minutes each with 5 works of art. The organizers want participants to give themselves enough time to really examine the work and draw their own interpretations and conclusions from it. It’s a beautiful goal in a world where everyone runs at a frenetic pace! The official Slow Art Day 2015 was Saturday, April 11. So while I didn’t get my act together in time to join one of the local DC groups, I decided to have a little Slow Art myself at the National Gallery of Art. I know the National Gallery of Art very well. Not only is it one of the best art collections in the world, it’s free! So I’ve probably been about 50 or so times (including the pop-up studio days!). The cost actually makes a mental difference. Since I can drop in anytime for nothing, I don’t feel obligated to see it all. I literally can stop by just to see the Dutch Masters, or a couple Italian Renaissance paintings, or the current special exhibition. There’s no pressure to “get my money’s worth” which in itself encourages slow viewing. I’m also a local so any rainy can quickly turn into a museum day. Not bad right? 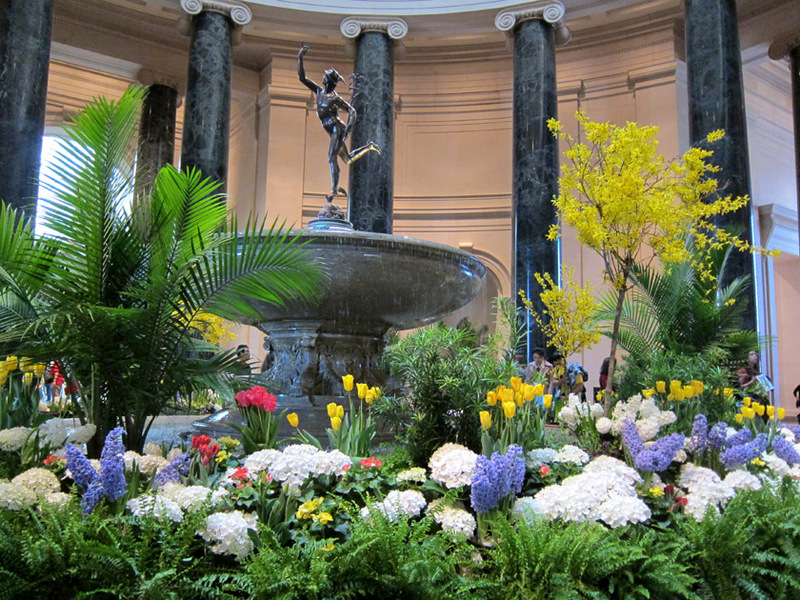 For my Slow Art Day, I decided to focus on the Impressionism galleries. In general the NGA curators like to move paintings around from time to time and rotate in new ones, so I thought I would pick 5 paintings once I got there based on what struck me. As you’ll see below, I had a very enjoyable Slow Art Day visit! It’s amazing that for as many times as I’ve been to this museum, there were still new things to see or notice. It only shows the importance of moving slowly. I immediately noticed two “Nanny paintings” just inside the Impressionism Galleries. 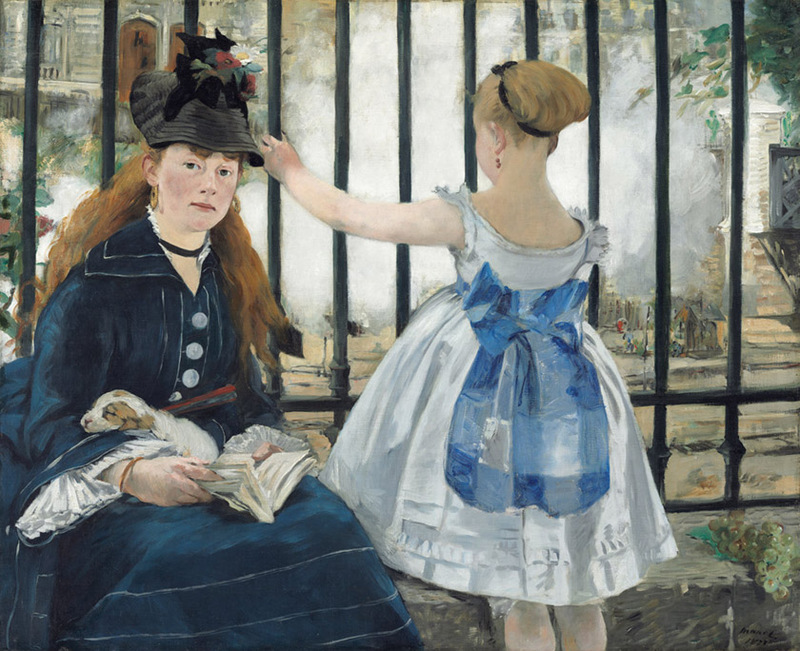 Eva Gonzalès’ Nanny and Child had been hung next to Edouard Manet’s The Railway. Both feature a young governess and an anonymous child. As a nice historical connection, Eva Gonzalès was the only official student that Manet ever accepted. This offered an excellent opportunity to examine each artist individual and then together in their handling of similar subject matter. Edouard Manet’s “The Railway” is one of the highlights of the entire museum, likely because of its incredible composition and psychological tension. A well dressed woman hunches over to read a book. Her arm is constrained by a sleeping dog. The viewer has obviously disturbed her; we can read a mixture of annoyance, discomfort and suspicion in her expression. On the other hand, the well dressed child turns her back to the viewer and clings to the iron fence fence of the train station. There is a great contrast between the silky white of the girl’s dress and the dirty, puffy white smoke from the trains. The composition is incredibly bold and modern. The nanny occupies less than half the painting with part of her dress cropped off along the edge. Yet even the little girl isn’t the center of the painting which leaves an empty swath of space on the right of the image. Following the lateral movement of the girl’s arm, we’re brought right back to the unnerving expression of the nanny. Gonzalès takes a decidedly different approach to the same subject of Nanny and child. Her sitter is positioned in the center of the painting and holds flowers, perhaps a gift from the little girl. Her voluminous outfit gives her an air of regality. I also can’t help seeing a reference to classic images of Mary in the Nanny’s self-contained pose and clear maternal role. The lines of the fence, the back shrubs and the umbrella handle all lead to the woman’s face which is relaxed and bemused. 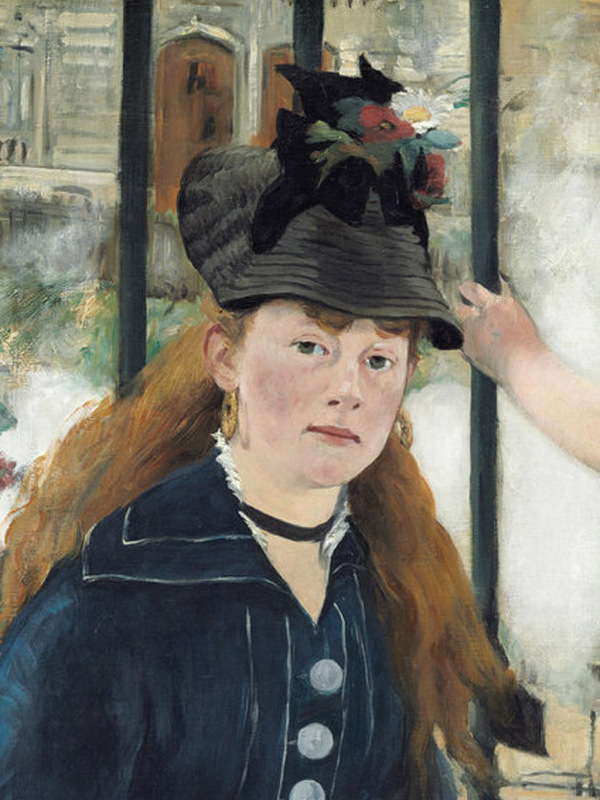 Unlike in Manet’s painting, the child is relegated to the side and, given the color of her dress, seems to blends into her blue-grey surroundings. The more I looked at the painting, the more forced and staged this arrangement appeared. Whereas I can imagine Manet walk upon this railway scene, Gonzalès appears to have stopped the Nanny mid-stroll. 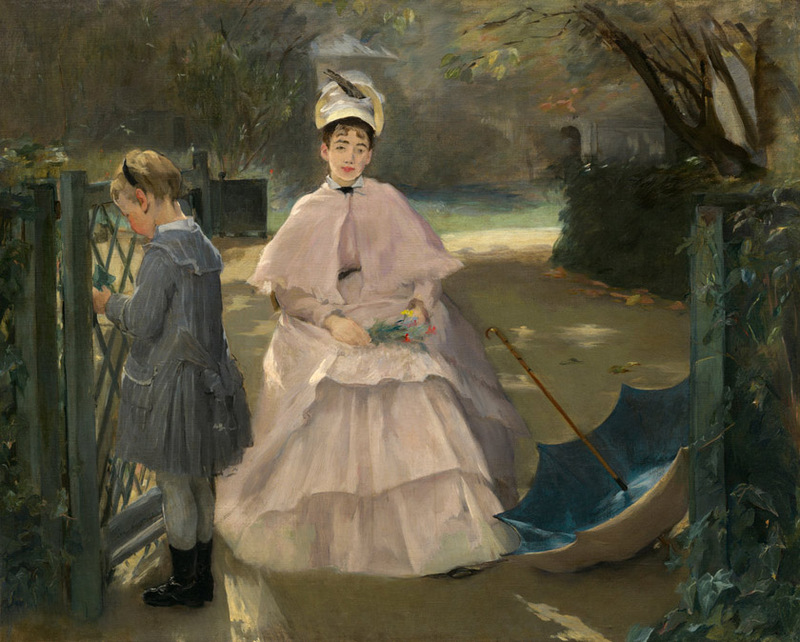 The woman in pink appears to be sitting inside a gate or other narrow passage point between two areas of a garden which doesn’t seem natural. Her umbrella is quite bizarrely thrown down next to her. While the umbrella balances the child in the composition, it suggests a spontaneity that doesn’t seem right giving the seating. To me, the scene seems contrived. Maybe that’s why the woman looks to be smiling – she’s entertained by the artist’s process of arranging the subjects. I feel like both paintings are primarily about the Nanny character. The children’s faces are hidden because they don’t necessarily matter beyond what they represent to the women. 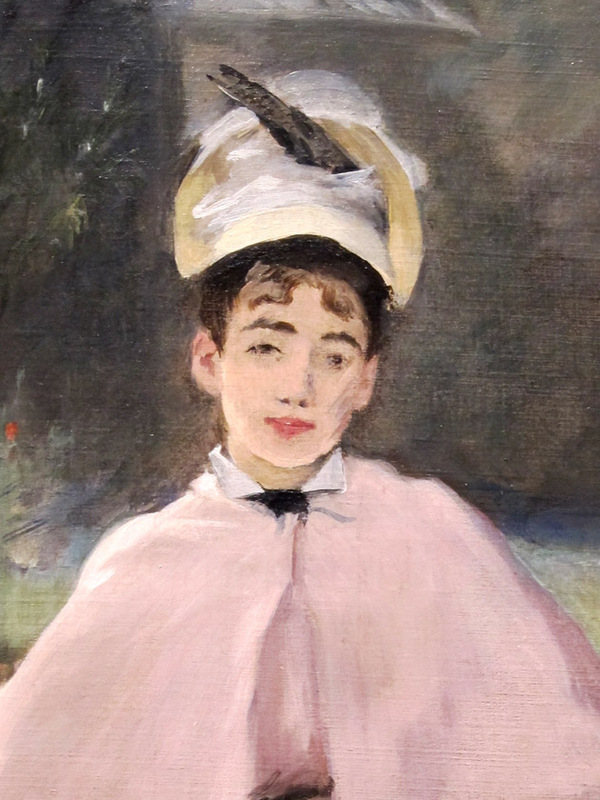 Manet’s Nanny is approximately the same size as her charge which is perhaps a powerful statement about social status and her lack of self-determination. We can imagine her getting frustrated with carrying the child’s puppy, following along after the whims of the little girl, and especially with trying to keep that bright white dress clean. She feels burdened, but is even more upset by the intrusion of the viewer into her private circumstances. By comparison, Gonzalès’ painting seems far less “loaded”. It’s a pretty portrait of a woman who just happens to be watching a child. Placed at the center of the work, we recognize her value outside of and beyond that of just caring for a little girl. Emphasizing this, the girl is not interacting with the woman and literally stands on the periphery. Every student eventually develops his or her own style and I think we definitely see that here. Although her brushwork is a little looser, Gonzalès still paints the folds of the pink dress with a flatness like Manet. While her painting isn’t has daringly arranged as The Railway, she does show an excellent use of contrasting colors and zones of dark and light like Manet. Where Gonzalès demonstrates her uniqueness as an artist is in her approach to and outlook about her subjects. Manet painted gritty, real people. While I like this about him (especially compared to the annoying, bourgeois party-people in Renoir’s paintings), his paintings can get very pessimistic. Manet wants to shed light on something shocking in modern Parisian society but he leaves it at that. In Nanny and Child, Gonzalès is picking up on the humanity of her subject. Perhaps her means of shocking the audience is by showing the goodness of people overlooked by society. Eva Gonzalès, “A Loge at the Théâtre des Italiens” 1874, Musée d’Orsay, Paris. 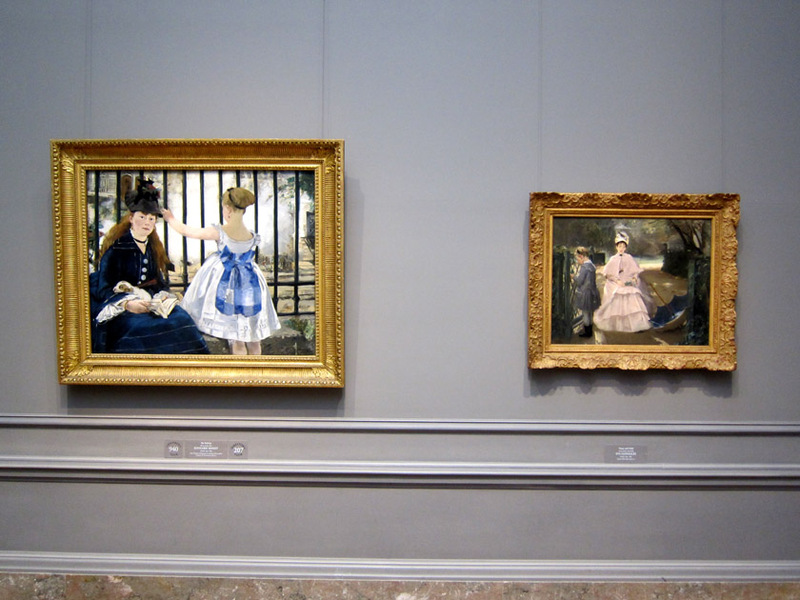 If you translated these Nanny paintings into modern nightly news stories, Manet would be presenting a powerful, investigative news piece on the horrible conditions of the working poor and the isolation between economic classes. On the other hand, Gonzalès would be filing a feel good, human interest story about a compassionate maid and would be chastising viewers for taking wonderful, everyday people for granted. With no plans for my visit and only expecting to take a nice long look at a handful of paintings, I had a great time! I have to admit I didn’t know anything about Eva Gonzalès before seeing this painting and was really happy I discovered her work. (To be fair, she died in childbirth at 34 so she doesn’t have a huge catalog.) The National Gallery of Art needs to be thanked for placing these two very related pieces together. It’s a brilliant piece of curatorial work and was excellent material for my Slow Art Day. With any luck, I won’t have to wait until April 2016 to do this again! So what beautiful things have you discovered when you decided to slow down? A pair of weeks ago I experienced some kind of ultra-slow-artistic-nirvana in front of the recently restored Rogier van der Weyden’s Crucifixion (Prado Museum). I really don’t know how long I stood in awe there; an ethernity. In some occasions, Slow Art is not an option, it is a mandate. Crucifixion apart (wich is a masterpiece), I totally agree with the “slow art” philosophy. 10 paintings per hour means nirvana. 100 paintings per hour means headache. What a wonderful story! I’m not surprised time slows down when you find a sublimely beautiful painting. That also seems to happen when you find a gorgeous church or secluded cove. I’m really happy that there is a slow art movement. 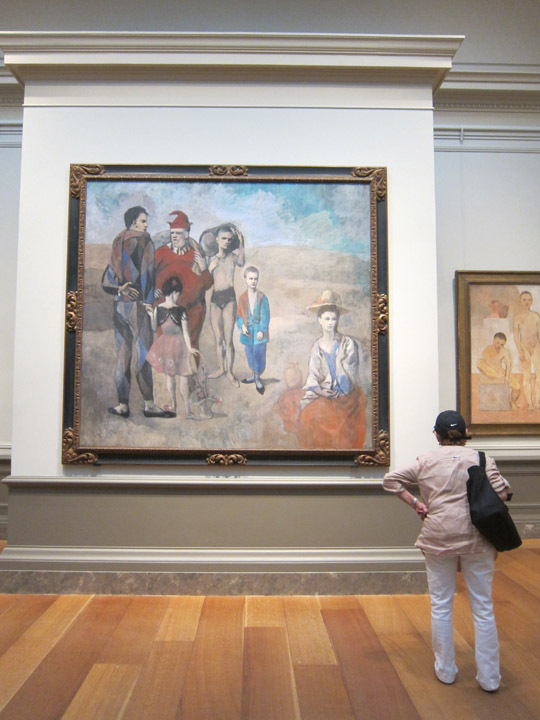 Visitors need to feel free to “miss” parts of the museum if that means a better experience with the art they do see.